Prepare yourself for one of the most challenging games of all time! 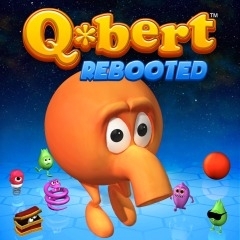 Remastered for PlayStation®, Steam, iOS and Android, Q*bert: Rebooted features the classic version of Q*bert and an all new action packed version of the arcade mega-hit. Dodge enemies, evade death, and navigate your way through villainous isometric levels in this iconic, critically acclaimed game. Q*bert: Rebooted introduces new enemies, playable characters, power-ups, traps, gem collecting, and is chock full of new challenges that it will leave you feeling victorious or demanding a do over.